KOREA/SPAIN: Samsung expands its smartphone range, plans market dominance | What Hi-Fi? The deal will allow easy upload of 3D content via LG's Optimus 3D and Optimus Pad devices, the Optimus 3D being the first smartphone to allow direct upload/download and viewing of 3D video on YouTube's dedicated 3D channel. 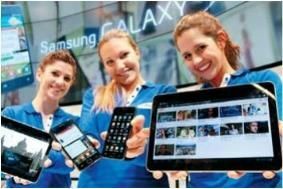 The new Samsung devices launched at MWC are the Galaxy S2 smartphone and Galaxy Tab 10.1. Both are slimmer than the existing models, and feature larger screens. The Galaxy S2 has a 4.3in touchscreen in place of the original's 4in display, and uses what Samsung calls Super AMOLED Plus technology to reduce power consumption while maintaining brightness and clarity. A dual-core processor is used to give speed said to equal that of a PC, and the new phone runs Android 2.3, aka Gingerbread, a key function of which is the ability to make wireless payments. Yet the phone is lighter and thinner than the original Galaxy S, shaving 5g off the weight and 1.4mm from the thickness: the new model is just 8.5mm thick and weighs 116g. Shin says that the company hopes the Galaxy S2 will become the new standard for smartphones when it appears, and will build on the 10m+ Galaxy S phones sold since that model was launched eight months ago. If the Galaxy S2 is designed to attack the iPhone, then the new Galaxy Tab 10.1 tablet PC is all about taking the fight to the iPad. It has a much larger screen than the original model – 10.1in instead of 7in, and yet is thinner, at just 10.9mm. It runs Honyecomb, Google's latest tablet PC operating system, on a 1GHz dual-core processor, and looks likely to be more expensive than the original Tab when it goes on sale. That 10.1in screen means the new Galaxy Tab has a larger display than the 9.7in iPad, but Samsung will have an uphill struggle to match iPad sales: Apple has sold 14.8m iPads in just under a year, while the original Galaxy Tab is estimated to have sold 2m units since its October 2010 launch.